Die Lunæ, 4 Septembris, 1648. SIR Anthony Irby reports from the Committee at Goldsmiths Hall, divers Fines and Compositions of Delinquents: Whereupon it is resolved as followeth; viz. Resolved, &c. That this House doth accept of the Sum of One thousand and Five hundred Pounds, for a Fine, for the Delinquency of Edward Kynaston, of Oateley in the County of Salop, Esquire: His Offence, That he was in Arms against the Parliament: He rendered in November 1645: His Estate, in Fee, in Possession, per Annum, Nine hundred Fifty Pounds Thirteen Shillings and Four-pence; in Debts, Nine hundred Eighty Pounds: For which his Fine, at a Tenth, is Two thousand Pounds: But if he settle Fifty Pounds per Annum out of the Tythes of Elsmere in the County of Salop aforesaid, on the Chapel of Dudleston, for Increase of the Maintenance of the Ministry there for ever; then to be allowed for the same Five hundred Pounds, and the Fine to remain Fifteen hundred Pounds. An Ordinance for granting a Pardon unto Edward Kynaston, of Oately in the County of Salop, Esquire, for his Delinquency, and for taking off the Sequestration of his Estate, was this Day read; and, upon the Question, passed: And ordered to be sent to the Lords for their Concurrence. Resolved, &c. That this House doth accept of the Sum of Two hundred Seventy-five Pounds, for a Fine, for the Delinquency of Thomas Foster, of the Inner Temple, London, Esquire: His Offence, That he left his Habitation, and went to Oxford, and resided there until the Surrender thereof; and hath the Benefit of those Articles: His Estate, for one Life, per Annum, Thirty Pounds; for Two Lives, per Annum, Fifty Pounds; for Three Lives, per Annum, Thirty Pounds: in Reversion, after a Life, per Annum, Sixty Pounds; personal Estate, Four hundred and Eighty-three Pounds: For which his Fine, at a Tenth, is Two hundred and Seventy-five Pounds. An Ordinance for granting a Pardon unto Thomas Foster, of the Inner Temple, London, Esquire, for a Fine for his Delinquency, and for taking off the Sequestration of his Estate, was this Day read; and, upon the Question, passed: And ordered to be sent to the Lords for their Concurrence. Resolved, &c. That this House doth accept of the Sum of Five hundred Threescore-and-eight Pounds, for a Fine, for the Delinquency of Henry Butler, of Henley, in the County of Dorsett, Gentleman: His Offence, That he was in Arms against the Parliament: He rendered in March 1645: His Estate in Fee, in Possession, per Annum, Sixtyone Pounds; in old Rents, per Annum, Four Shillings; for One thousand Years, per Annum, Sixty Pounds; for Six Years yet to come, per Annum, Three hundred and Fifty-six Pounds: For which his Fine, at a Sixth, is Five hundred and Sixty-eight Pounds. An Ordinance for granting a Pardon unto Henry Butler, of Henley in the County of Dorsett, Gentleman, for his Delinquency, and for taking off the Sequestration of his Estate, was this Day read; and, upon the Question, passed: And ordered to be sent to the Lords for their Concurrence. Resolved, &c. That this House doth accept of the Sum of Two hundred and Threescore Pounds, for a Fine, for the Delinquency of Nicolas Shephard, of Whatton in the County of Devon, Gentleman: His Offence, That he was in Arms against the Parliament: He rendered upon the Articles of Exeter: His Estate, in Fee, per Annum, One hundred Pounds; in old Rents, per Annum, Ten Pounds; personal Estate, Two hundred and Fifty Pounds: For which his Fine, at a Tenth, is Two hundred and Sixty Pounds. An Ordinance for granting a Pardon unto Nicolas Shepeard, of Whatton in the County of Devon, Gentleman, for his Delinquency, and for taking off the Sequestration of his Estate, was this Day read; and, upon the Question, passed: And ordered to be sent to the Lords for their Concurrence. Resolved, &c. That this House doth accept of the Sum of One hundred and Threescore Pounds, for a Fine, for the Delinquency of Robert Reeve, of Reading in the County of Berks, Esquire: His Offence, That he deserted his Dwelling, and went to Oxford: He rendered upon those Articles: His Estate for his Life, per Annum, One hundred and Eleven Pounds; in personal Estate, Four hundred and Eighty-eight Pounds: For which his Fine, at a Tenth, is One hundred and Sixty Pounds. An Ordinance for granting a Pardon unto Robert Reeve, of Reading in the County of Berks, Esquire, for his Delinquency, and for taking off the Sequestration of his Estate, was this Day read; and, upon the Question, passed: And ordered to be sent to the Lords for their Concurrence. Resolved, &c. That this House doth accept of the Sum of Seven hundred Thirty Pounds and Fourteen Shillings, for a Fine, for the Delinquency of Sir Thomas Wolrich, of Dudmaston in the County of Salop, Knight: His Offence, That he was in Arms against the Parliament: He rendered before December 1645: His Estate, in Fee, per Annum, in Possession, Two hundred Ninety-two Pounds and Seventeen Shillings; in old Rents, per Annum, Twenty-three Pounds; personal Estate, Three hundred Pounds: For which his Fine, at a Tenth, is Seven hundred Thirty Pounds and Fourteen Shillings. 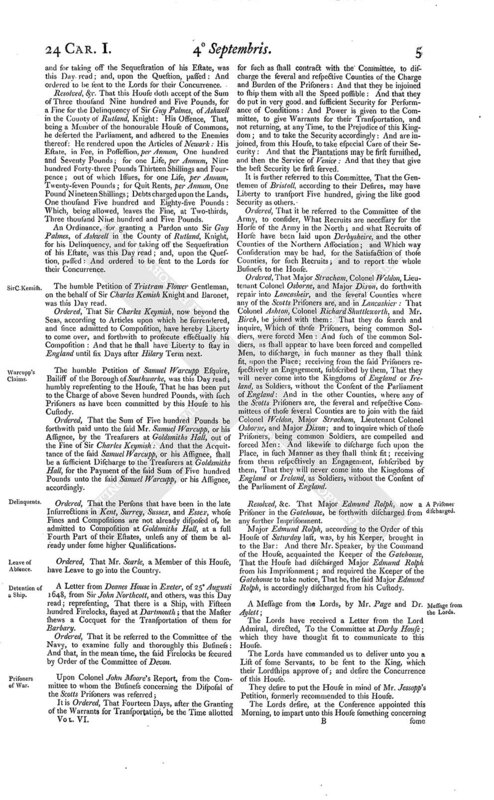 An Ordinance for granting a Pardon unto Sir Thomas Wolrich, of Dudmaston in the County of Salop, Knight and Baronet, for his Delinquency, and for taking off the Sequestration of his Estate, was this Day read; and, upon the Question, passed: And ordered to be sent to the Lords for their Concurrence. Resolved, &c. That this House doth accept of the Sum of Four hundred and Thirty-four Pounds, for a Fine, for the Delinquency of John Ford of Elynge in the County of Southampton, Gentleman: His Offence, That he deserted his Habitation, and resided in the Enemies Quarters: He rendered in April 1646: His Estate, in Fee and Fee Tail, per Annum, Sixty-eight Pounds; for Eleven Years, per Annum, One hundred Pounds; for Twentysix Years yet to come, per Annum, Forty Pounds: For which his Fine, at a Sixth, is Four hundred and Thirtyfour Pounds. An Ordinance for granting a Pardon unto John Ford, of Elynge in the County of Southampton, Gentleman, for his Delinquency, and for taking off the Sequestration of his Estate, was this Day read; and, upon the Question, passed: And ordered to be sent to the Lords for their Concurrence. Resolved, &c. That this House doth accept of the Sum of Three hundred Pounds, for a Fine, for the Delinquency of Laurence Carlile, of Bishop's Norton in the County of Lincoln, Clerk: His Offence, That he left his Habitation, and resided in Newark, whilst it was a Garison held against the Parliament: He rendered upon those Articles: His Estate, in Fee Tail, per Annum, Ninety Pounds: For which his Fine, at a Third, is Three hundred Pounds. 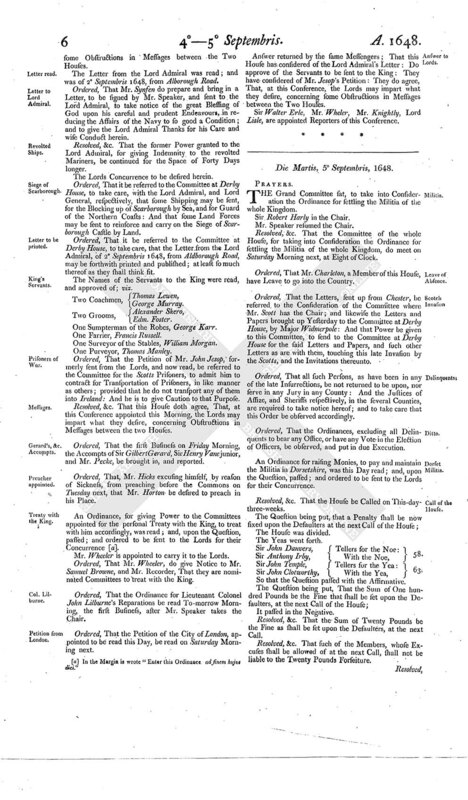 An Ordinance for granting a Pardon unto Laurence Carlisle, was this Day read; and, upon the Question, passed: And ordered to be sent to the Lords for their Concurrence. Resolved, &c. That this House doth accept of the Sum of One hundred Pounds, for a Fine, for the Delinquency of Nicolas Spicer, of the City of Exeter, Merchant: His Offence, That he was in Arms against the Parliament: He rendered upon the Articles of Exeter: His Estate, for Two Lives, per Annum, Twenty Pounds; for Six Years per Annum, Twenty-six Pounds; for Ten Years, per Annum, Ten Pounds; for Six Years, and Two Lives, per Annum, Twenty-six Pounds: There is owing to him Two hundred and Eighty-eight Pounds; and he owes Two hundred and Eighty Pounds: For which his Fine, at a Tenth, is One hundred Pounds. Resolved, &c. That this House doth accept of the Sum of Fifty-five Pounds, for a Fine, for the Delinquency of Gilbert Yard, of the City of Exeter, Gentleman: His Offence: That he adhered to the Forces raised against the Parliament: He rendered upon the Articles of Exeter: His Estate in old Rents, per Annum, Seven Pounds; in Debts, One hundred and Sixty Pounds; out of which issue per Annum, One Pounds: Which leaves the Fine, at a Tenth, Fifty-five Pounds. Resolved, &c. That this House doth accept of the Sum of Fifty-five Pounds, for a Fine, for the Delinquency of George Leach, of the City of Exeter, Brewer: His Offence, That he was in Arms against the Parliament: He rendered upon the Articles of Exeter: His Estate for Life, by Copy of Court Roll, per Annum, Twenty Pounds; personal Estate, One hundred and Fifty-five Pounds: For which his Fine is Fifty-five Pounds. An Ordinance for granting a Pardon unto Nicolas Spicer, Gilbert Yard, and George Leach, for their Delinquencies, and for taking off the Sequestrations of their Estates, was this Day read; and, upon the Question, passed: And ordered to be sent to the Lords for their Concurrence. Resolved, &c. That this House doth accept of the Sum of Two hundred and Thirty Pounds, for a Fine, for the Delinquency of Toby Hodson, of the City of York, Gentleman: His Offence, That he was in Arms against the Parliament: He rendered before December 1645: His Estate, for Three Lives, per Annum, One hundred and Twenty Pounds; for Two Lives, per Annum, Forty Pounds: For which his Fine, at a Tenth, is Two hundred and Thirty Pounds. An Ordinance for granting a Pardon unto Toby Hodson, of the City of York, Gentleman, for his Delinquency, and for taking off the Sequestration of his Estate, was this Day read; and, upon the Question, passed: And ordered to be sent to the Lords for their Concurrence. Resolved, &c. That this House doth accept of the Sum of Three thousand Nine hundred and Five Pounds, for a Fine for the Delinquency of Sir Guy Palmes, of Ashwell in the County of Rutland, Knight: His Offence, That, being a Member of the honourable House of Commons, he deserted the Parliament, and adhered to the Enemies thereof: He rendered upon the Articles of Newark: His Estate, in Fee, in Possession, per Annum, One hundred and Seventy Pounds; for one Life, per Annum, Nine hundred Forty-three Pounds Thirteen Shillings and Fourpence; out of which Issues, for one Life, per Annum, Twenty-seven Pounds; for Quit Rents, per Annum, One Pound Nineteen Shillings; Debts charged upon the Lands, One thousand Five hundred and Eighty-five Pounds: Which, being allowed, leaves the Fine, at Two-thirds, Three thousand Nine hundred and Five Pounds. An Ordinance, for granting a Pardon unto Sir Guy Palmes, of Ashwell in the County of Rutland, Knight, for his Delinquency, and for taking off the Sequestration of his Estate, was this Day read; and, upon the Question, passed: And ordered to be sent to the Lords for their Concurrence. The humble Petition of Tristram Flower Gentleman, on the behalf of Sir Charles Kemish Knight and Baronet, was this Day read. Ordered, That Sir Charles Keymish, now beyond the Seas, according to Articles upon which he surrendered, and since admitted to Composition, have hereby Liberty to come over, and forthwith to prosecute effectually his Composition: And that he shall have Liberty to stay in England until fix Days after Hilary Term next. The humble Petition of Samuel Warcupp Esquire, Bailiss of the Borough of Southwarke, was this Day read; humbly representing to the House, That he has been put to the Charge of above Seven hundred Pounds, with such Prisoners as have been committed by this House to his Custody. Ordered, That the Sum of Five hundred Pounds be forthwith paid unto the said Mr. Samuel Warcupp, or his Assignee, by the Treasurers at Goldsmiths Hall, out of the Fine of Sir Charles Keymish: And that the Acquittance of the said Samuel Warcupp, or his Assignee, shall be a sufficient Discharge to the Treasurers at Goldsmiths Hall, for the Payment of the said Sum of Five hundred Pounds unto the said Samuel Warcupp, or his Assignee, accordingly. Ordered, That the Persons that have been in the late Insurrections in Kent, Surrey, Sussex, and Essex, whose Fines and Compositions are not already disposed of, be admitted to Composition at Goldsmiths Hall, at a full Fourth Part of their Estates, unless any of them be already under some higher Qualifications. Ordered, That Mr. Searle, a Member of this House, have Leave to go into the Country. A Letter from Deanes House in Exeter, of 25Augusti 1648, from Sir John Northcott, and others, was this Day read; representing, That there is a Ship, with Fifteen hundred Firelocks, stayed at Dartmouth; that the Master shews a Cocquet for the Transportation of them for Barbary. Ordered, That it be referred to the Committee of the Navy, to examine fully and thoroughly this Business: And that, in the mean time, the said Firelocks be secured by Order of the Committee of Devon. It is Ordered, That Fourteen Days, after the Granting of the Warrants for Transportation, be the Time allotted for such as shall contract with the Committee, to discharge the several and respective Counties of the Charge and Burden of the Prisoners: And that they be injoined to ship them with all the Speed possible: And that they do put in very good and sufficient Security for Performance of Conditions: And Power is given to the Committee, to give Warrants for their Transportation, and not returning, at any Time, to the Prejudice of this Kingdom; and to take the Security accordingly: And are injoined, from this House, to take especial Care of their Security: And that the Plantations may be first furnished, and then the Service of Venice: And that they that give the best Security be first served. It is further referred to this Committee, That the Gentlemen of Bristoll, according to their Desires, may have Liberty to transport Five hundred, giving the like good Security as others. 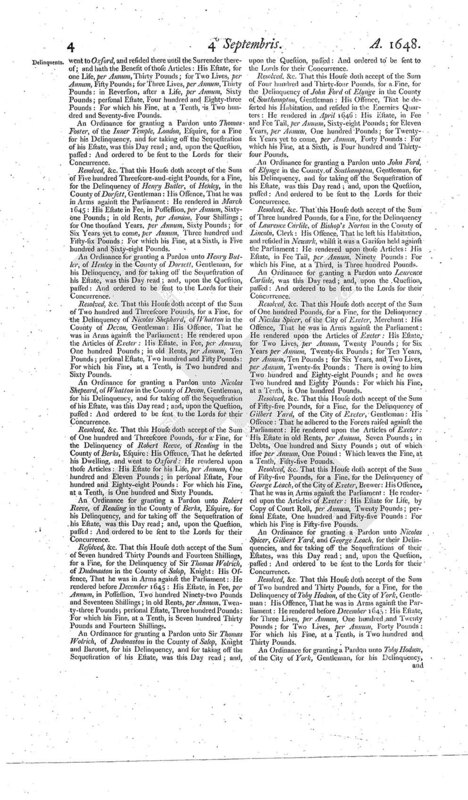 Ordered, That it be referred to the Committee of the Army, to consider, What Recruits are necessary for the Horse of the Army in the North; and what Recruits of Horse have been laid upon Derbysheire, and the other Counties of the Northern Association; and Which way Consideration may be had, for the Satisfaction of those Counties, for such Recruits; and to report the whole Business to the House. Ordered, That Major Stracham, Colonel Weldon, Lieutenant Colonel Osborne, and Major Dixon, do forthwith repair into Lancasheir, and the several Counties where any of the Scotts Prisoners are, and in Lancashier: That Colonel Ashton, Colonel Richard Shuttleworth, and Mr. Birch, be joined with them: That they do search and inquire, Which of those Prisoners, being common Soldiers, were forced Men: And such of the common Soldiers, as shall appear to have been forced and compelled Men, to discharge, in such manner as they shall think fit, upon the Place; receiving from the said Prisoners respectively an Engagement, subscribed by them, That they will never come into the Kingdoms of England or Ireland, as Soldiers, without the Consent of the Parliament of England: And in the other Counties, where any of the Scotts Prisoners are, the several and respective Committees of those several Counties are to join with the said Colonel Weldon, Major Stracham, Lieutenant Colonel Osborne, and Major Dixon; and to inquire which of those Prisoners, being common Soldiers, are compelled and forced Men: And likewise to discharge such upon the Place, in such Manner as they shall think fit; receiving from them respectively an Engagement, subscribed by them, That they will never come into the Kingdoms of England or Ireland, as Soldiers, without the Consent of the Parliament of England. Resolved, &c. That Major Edmund Rolph, now a Prisoner in the Gatehouse, be forthwith discharged from any further Imprisonment. Major Edmund Rolph, according to the Order of this House of Saturday last, was, by his Keeper, brought in to the Bar: And there Mr. Speaker, by the Command of the House, acquainted the Keeper of the Gatehouse, That the House had discharged Major Edmund Rolph from his Imprisonment; and required the Keeper of the Gatehouse to take notice, That he, the said Major Edmund Rolph, is accordingly discharged from his Custody. The Lords have received a Letter from the Lord Admiral, directed, To the Committee at Derby House; which they have thought fit to communicate to this House. The Lords have commanded us to deliver unto you a List of some Servants, to be sent to the King, which their Lordships approve of; and desire the Concurrence of this House. They desire to put the House in mind of Mr. Jessopp's Petition, formerly recommended to this House. The Lords desire, at the Conference appointed this Morning, to impart unto this House something concerning some Obstructions in Messages between the Two Houses. The Letter from the Lord Admiral was read; and was of 2 Septembris 1648, from Alborough Road. Ordered, That Mr. Synfen do prepare and bring in a Letter, to be signed by Mr. Speaker, and sent to the Lord Admiral, to take notice of the great Blessing of God upon his careful and prudent Endeavours, in reducing the Affairs of the Navy to so good a Condition; and to give the Lord Admiral Thanks for his Care and wise Conduct herein. Resolved, &c. That the former Power granted to the Lord Admiral, for giving Indemnity to the revolted Mariners, be continued for the Space of Forty Days longer. Ordered, That it be referred to the Committee at Derby House, to take care, with the Lord Admiral, and Lord General, respectively, that some Shipping may be sent, for the Blocking up of Scarborough by Sea, and for Guard of the Northern Coasts: And that some Land Forces may be sent to reinforce and carry on the Siege of Scarborough Castle by Land. Ordered, That it be referred to the Committee at Derby House, to take care, that the Letter from the Lord Admiral, of 2 Septembris 1648, from Aldborough Road, may be forthwith printed and published; at least so much thereof as they shall think sit. The Names of the Servants to the King were read, and approved of; viz. One Sumpterman of the Robes, George Karr. One Surveyor of the Stables, William Morgan. 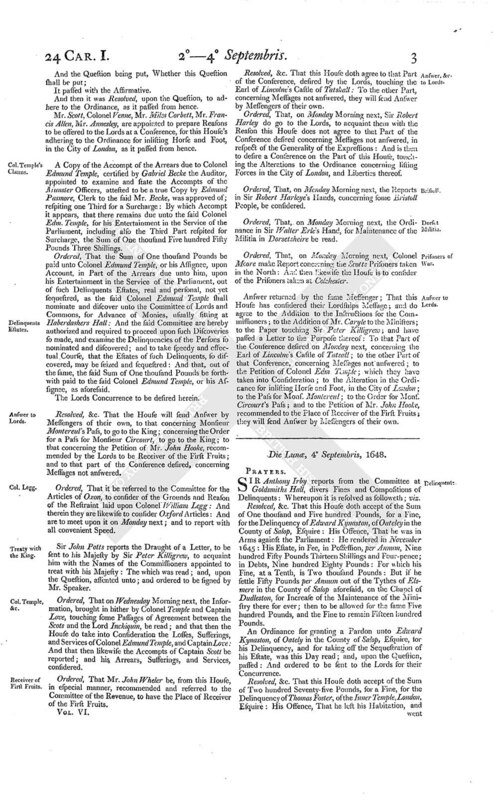 Ordered, That the Petition of Mr. John Jesop, formerly sent from the Lords, and now read, be referred to the Committee for the Scotts Prisoners, to admit him to contract for Transportation of Prisoners, in like manner as others; provided that he do not transport any of them into Ireland: And he is to give Caution to that Purpose. Resolved, &c. That this House doth agree, That, at this Conference appointed this Morning, the Lords may impart what they desire, concerning Obstructions in Messages between the two Houses. Ordered, That the first Business on Friday Morning, the Accompts of Sir Gilbert Gerard, Sir Henry Vane junior, and Mr. Pecke, be brought in, and reported. Ordered, That, Mr. Hicks excusing himself, by reason of Sickness, from preaching before the Commons on Tuesday next, that Mr. Horton be desired to preach in his Place. An Ordinance, for giving Power to the Committees appointed for the personal Treaty with the King, to treat with him accordingly, was read; and, upon the Question, passed; and ordered to be sent to the Lords for their Concurrence (fn. 1). Mr. Wheeler is appointed to carry it to the Lords. Ordered, That Mr. Wheeler, do give Notice to Mr. Samuel Browne, and Mr. Recorder, That they are nominated Committees to treat with the King. Ordered, That the Ordinance for Lieutenant Colonel John Lilburne's Reparations be read To-morrow Morning, the first Business, after Mr. Speaker takes the Chair. Ordered, That the Petition of the City of London, appointed to be read this Day, be read on Saturday Morning next. Answer returned by the same Messengers; That this House has considered of the Lord Admiral's Letter: Do approve of the Servants to be sent to the King: They have considered of Mr. Jesop's Petition: They do agree, That, at this Conference, the Lords may impart what they desire, concerning some Obstructions in Messages between the Two Houses. Sir Walter Erle, Mr. Wheler, Mr. Knightly, Lord Lisle, are appointed Reporters of this Conference. 1. [a] In the Margin is wrote "Enter this Ordinance ad sinem hujus diei."